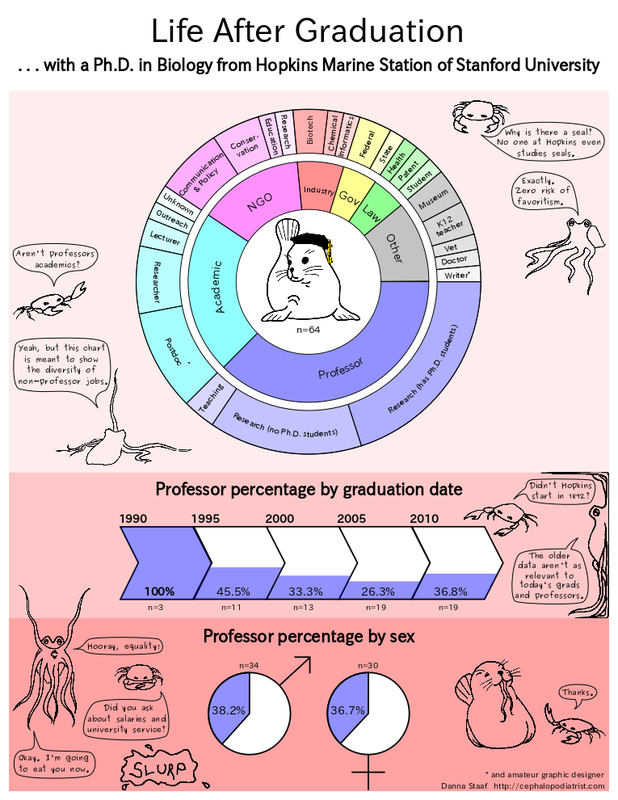 The Cephalopodiatrist: Life After A Biology Ph.D.
Life After A Biology Ph.D.
As I understand it, breeding Ph.D.s like academic rabbits made sense in the postwar era when academic institutions, and therefore new professorships, were also spawning like mad. But that was a long time ago. Today, there's a glut of Ph.D.s on the market, all fighting against desperate odds to get the only job they're qualified for: professor. At least, that's the bleak narrative that gets a lot of press. But in fact many of us Ph.D.s didn't especially want to be professors, and we've made our merry way into a diversity of alternative careers, from patent lawyer to high school teacher. The current grad students at my alma mater are curious about these different options, so I thought I'd make a chart**. And given how few Ph.D.s are going to become professors anyway, let's stop calling these careers "alternative." We're not sad drips from a leaky pipeline. We are delicious slices of pie, RAINBOW PIE! - Postdocs are sometimes viewed as pre-professors, but a postdoc is really the default option if you haven't quite figured out what you want to do next. Plenty of folks who ended up in NGOs, industry, government, etc., did an academic postdoc first. - The "unknown" academic is a graduate from the nineties whose current whereabouts I've been unable to track down. She was definitely employed at a university at some point post-graduation, though it's not clear whether she was a professor, and she's not on their staff pages now. Mystery! - Given the depressing data about gender gaps in academia, I'm a bit surprised and quite heartened that female and male Hopkins grads became professors in roughly equal numbers. Of course, as Crabby points out, there's always a chance for other inequalities. - I hope none of my blather comes across as anti-professor. I'm super proud of all my friends who are kickin' it academy style. That's why your slice of pie is such a nice blueberry color! - Come to think of it, why doesn't anyone study the seals? They're RIGHT THERE! * For variable values of "few." ** While I'm culpable of the idea and execution, it could never have been done without the input, support, and mad data-gathering skills of many other alumni. Thanks to the Hopkins grads--you're all stars! Interesting! Can you clarify what you mean by "R1 / R2 / Teaching"? According to the Internet, the classifications R1 and R2 are outdated, but both apparently referred to doctoral-degree-granting institutions. I think there's also a technical flaw in your first paragraph, in that tenured professors also exist at non-doctoral-degree-granting institutions. I don't know the statistics, and it's probably still true that there isn't room in academia for all Ph.D.s to get tenure anywhere, but it's not quite so cut and dried. Thanks so much for catching these mistakes! I edited the second sentence to "professors with grad students" instead of "tenured professors," but that doesn't address the overall statistical issue. I was guilty of very lazy thinking there. Just grabbing some quick numbers from Wikipedia's article on the Carnegie Classification of Institutions of Higher Education indicates that doctorate-granting universities are less than a twelfth of all higher ed institutions, so a prof with Ph.D. students could produce twelve over the course of a career and they could all finds homes as profs. Of course that is an EXTREMELY rough approximation, and I'm sure there are a zillion things it doesn't take into account . . . oh man, I wish I had time to look at this in depth! I renamed the professor categories to "Research (has Ph.D. students), Research (no Ph.D. students), Teaching." In biology, "Research" means you have a lab, which is a pretty binary distinction. I think the universities, and therefore the profs, without Ph.D. students have a greater emphasis on teaching, but that's more nebulous so I was hesitant to put it in. I would be happy to continue re-naming these categories if people have better suggestions.